Stand-alone listening device for users without a computer. When you want your transmission to reach for example elderly people, you will find that many of them do not have a computer available. There are also situations in which a (full) PC would not be necessary or practical, such as when coupling your transmission into the audio installation of another building. 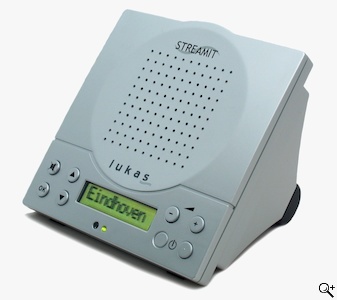 Especially for situations like these, there is the "Lukas" listening device of the Streamit brand. This small device is perfectly suitable to play all transmissions from the Audiozender 2.0 models. This is possible by means of the powerful built-in loudspeaker, and via a line-level output that can be connected to an audio installation. The "Lukas" is equipped with a built-in telephone modem for the usual analog telephone line. So even where no internet connection is available, the Lukas can let your transmissions be heard. This will of course cause the appropriate telephone costs to be charged to the user. When a broadband internet connection is available, such as ADSL or cable modem, the Lukas can be connected via its Ethernet port. The Lukas can then be used without further costs. Thanks to these versatile connection options, the Lukas is also ideal for "portable" use, for example when a user will regularly be at different locations, or when your listener group changes often. Once the Lukas is connected and set up, using it can hardly be simpler: on/off, and volume. For extra comfort, a handy remote control is supplied. The user manual consists of a single picture and less than 10 lines of text, and can be understood by everyone. When connected to a broadband network, an option is available in which the Lukas will automatically keep trying to see if a transmission is available. Then there is no need to even use the on/off button.